In the world of everyday experience we conceive of three dimensions of space. Through any point, no more than three perpendicular lines may pass. The notion that there might be more than three dimensions has traditionally been the domain of science fiction shows like The Twilight Zone. In this engaging lecture (click image above to watch), theoretical physicist Lawrence Krauss explains the growing respectability of extra-dimensional theories in physics, tracing the evolution of the idea from Plato's cave through Edwin A. Abbott's Flatland, and from Einstein-Minkowski spacetime through Kaluza-Klein theory, on into modern-day string theory. 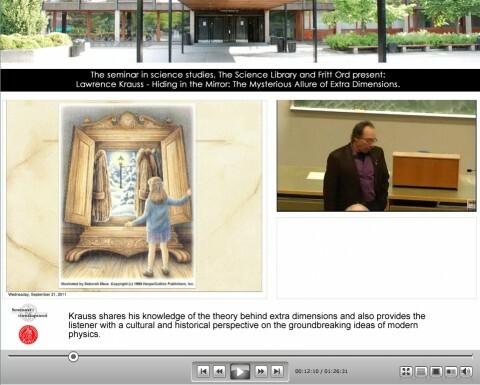 Titled "Hiding in the Mirror: The Mysterious Allure of Extra Dimensions," Krauss's presentation was given in September at a conference in Oslo, Norway, organized by the Fritt Ord Foundation. The speech lasts about an hour and is followed by a question-and-answer session.